Jacks wife Freda, an all-day cafe, has recently opened a new outpost in New York City’s Chelsea neighborhood. It’s located at the southeast corner of 8th Avenue and 16th Street. It seats about 60 people at mostly tables for two but there is also a communal table with backless banquettes in the center of the restaurant, where you may be seated. It’s a welcome addition to the Chelsea food scene. You may want to try Jack’s Wife Freda for a quick weekend brunch. I tried the chicken Prego sandwich, accompanied by French fries ($15). Thin slices of grilled chicken breast come piled on a roll with smoked paprika aioli and watercress. I opted for the fries. You could also opt for a side of arugula salad, if you want to be a bit more healthy! If you are a vegetarian, you may want to try the grilled eggplant baguette. It comes with roasted tomato, mozzarella, olive tapenade and pesto. ($14). 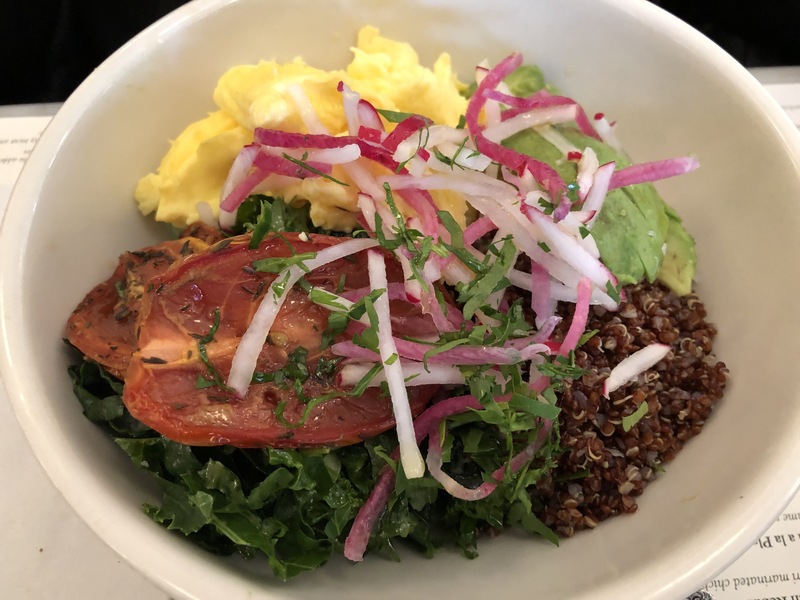 While at Jack’s Wife Freda, I also tried Maya’s Breakfast Bowl ($18). It comes served with scrambled eggs, squash spaghetti, roasted tomato, quinoa and shredded kale. I was tee-totaling but if you want to get your drink on, you can. A cantaloupe mimosa will set you back $12; a Bloody Mary will cost you $13. For a delicious meal in Chelsea, try Jack’s Wife Freda! For another great meal in Chelsea, try the nearby Seamore’s Chelsea! ← Second US Starbucks Reserve Roastery Opens in NYC: The Lowdown!